Political, philosophical, and logistical questions aside, one thing appears clear about the recent disaster in New Orleans: the city is about to undergo the largest rebuilding effort in the history of the U.S.
No one knows how the new Orleans will compare to the old Orleans, but clearly a lot of interesting changes are in order. What new technologies will solve the geological challenges of the area? How many natives will return? How will a new population mix affect the culture of the city? Will the tourism and shipping industries be stronger in the long term due to this disaster and recovery? Nobody knows for sure the answers to these questions, but the purpose of the 6th monthly Mike Industries iPod-A-Month Creativity Competition is to try and find out; to explore what the rebuilt New Orleans might look like. Using your medium of mastery (web, video, audio, print, etc. ), create a short marketing or educational piece for the new city. This could be a poster advertising the new Riverwalk, a narrative audio of the history of the city, or anything else which might be useful in attracting people to the New Easy. Humor is perfectly ok for this project but let’s please keep everything in good taste. The barrier to entry for this 6th competition is admittedly a bit high considering the skills required to put such a piece together, but the topic is important and I anticipate a few really great entries… albeit not 500 of them. Given the increased challenge of this month’s competition, I am upping the prize from an iPod Shuffle to an iPod Nano. Thanks also to my friend Loren Schwartz who, over dinner last week, suggested this contest and as a consequence won himself a Nano as well. And of course, iLounge will also be chipping into the prize pool as usual with a pair of $150 Etymolic earbuds. The competition will be open for exactly two weeks… ending at midnight on Tuesday, October 4th. Please post the link to your entry in the comments below. Note: All proceeds from Dreamhost signups which occur during this competition will be donated by me to the American Red Cross Hurricane Relief Fund. Additionally, Dreamhost will match that donation. If you’re thinking about switching hosting providers, now’s kind of a decent time to do it. 49 comments on “iPod Giveaway #6: Renew Orleans”. Leave your own? I’m guessing you mean Tuesday, October 4. Looks like a neat idea! I must say Mike, this is probably the best contest yet! (they’ve all been good, but this one is a great idea). I’ll definately be entering this time around. Very nice. I can’t wait to enter… I mean win. Was this their fault or yours? I was receiving this error from about 9am to 1pm GMT yesterday. What an amazing idea for a competition! Ralph: Whichever one you want. Phil: Yep. Yesterday was actually the first bad day I’ve had in about a year and a half of hosting. I want to say it was a lingering effect of the massive power outage in L.A. but who knows… they swapped my server out and it’s fine now. In any case, they’ve built up enough goodwill with me that I’m fine with it. For $7.95 a month, one bad day every 18 months is acceptable to me. Does the poster need to feature an iPod as in previous competitions? Chris: Good question. The answer is no… entries need not contain any reference to iPods. Great to see a nice contest again, and looking forward for sure excellent entries! I have few ideas … will post later. Disaster proof? And if those booster rocket things fail? Meteor hits the dome? There are going to be some interesting discussions happenning over at Humid Beings about the rebuild. This forum was set up by a group of concerned and passionate New Orleanians who care and have much at stake in the upcoming decisions in that great city. I hope to hear and see all of your ideas over there as well! it’s not to be taken seriously btw.. I know its not all that great but yeah — best I could come up with at the moment…can we only submit one entry or is there not a limit as to how many? props. and please feel free to join in the discussion. Paul Santolaria’s entry – AMAZING! I think Paul Santolaria’s entry is quite foolish and has nothing to do with this competition. It looks like some 14yr old kid photoshop’d a few old paintings and added some unnecessary ipods. Foolishness if you ask me. Excuse me if the entry doesn’t fit the contest restrictions; of course I will comply with any Mike Davidson’s final decision about its validity. Here’s my entry: The New Venice. Can we submit multiple entries as in the previous contests? Here it is after hours and hours of work I’ve finally completed my video that blends both the tragedy with hope on the horizon. I hope you like it! Just click on it and save it…..or maybe it’ll stream for you or something (depending on browser)….anyways there’s the file Enjoy! Just a simple poster idea, hope you all enjoy. I thought this contest was about the “future” of New Orleans, not a recap of all the destruction that has happened. Jason: Yep, you are correct. skinzer: I would follow the same guidelines you’d normally follow. ahh man my web hosting company’s servers are down…..isn’t that just great. My video link above obviously won’t work cause of it so i’m sorry about that. It’ll be back up by the end of the day. No offense to Mike B (Not D.). But I really don’t think that his entry even relates properly to this contest, to me, the video’s just a complete recap of all the destruction and damage. It shows no insight on how the future of New Orleans might be. I’m not saying that it’s not good, but it just doesn’t click with the whole point of this contest. What do I expect the rebuilt New Orleans to be? …I expect it to be the same great city it always was. The new Orleans will live on with old culture. Mike Mella’s entry gets my vote so far. Great job Mike Mella! It looks great! One thing: it would be even nicer if you added some looking ahead images or text, as most of it is looking back. Congratulations to everyone else who’s entered so far – they look awesome! Thanks for your comments David and Fred. 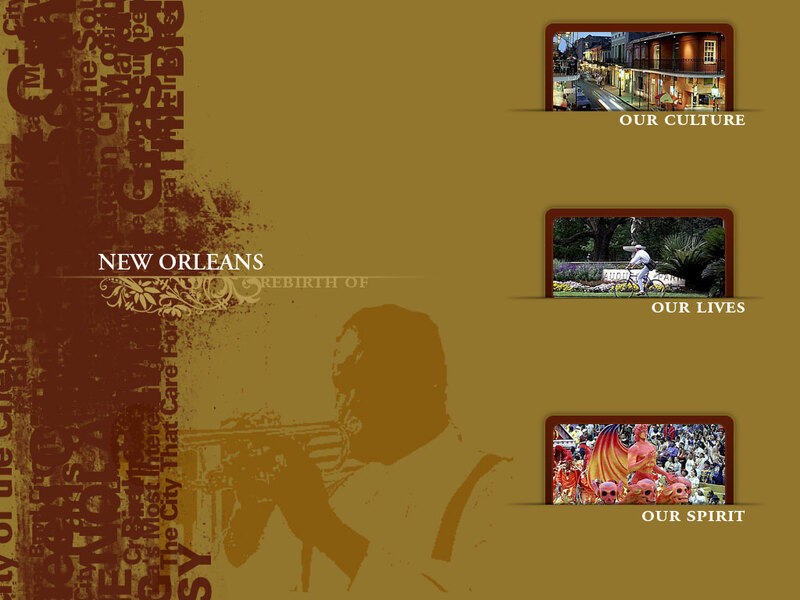 Actually, the colour images at the end of my entry are intended to represent the future New Orleans. They resemble the traditional impressions of the city because I’m suggesting that the original New Orleans was so wonderful that it deserves to be restored, hence the “Welcome back” toward the end. Inspiration thanks: Pieter Bruegel’s painting, Tower of Babel (1563), and slanguage (New Orleans).. This time I went for something inspirational. I created this image to show that the darkness that has enveloped America recently has been lifted, and that new hope has sprung forth from the recovery of New Orleans. once again, original 3d artwork + photoshop postprocessing. I think this iPod competition has had the worst reception so far. I doubt if there is anything here worth awarding an ipod to. I really need to stop posting here using some poor Oxton’s name and actually make time to show y’all what an actual entry to this competition should look like. Good luck with your new dig Mike. I am happy to have discovered this website, and moreso, a contest of such worthy subject matter. I am glad to see so many talented people that care about our fellow human beings! I say we give Katrina a taste of her own medicine. New Orleans has too much soul to stay down for long. A promotional poster in web resolution. I tried to combine a little bit of looking back with a lot of planning ahead. I hope you guys like it! Good luck and congratulations to everyone else who entered! If we are allowed one more entry, I’d like to place a Cover Concept (for a brochure) to go along with the marketing of the Convention and Visitors Bureau of New Orleans (where the colors and pictures became the inspiration. I wish good success to all the people who submitted their entries. My main goal was to help New Orleans citizens to get back in their town and to be safe there. I wanted to inspire the world about how this city could become great if everyone spent a small amount of money on it. I hope you’ll enjoy it. Any comments (good or bad) are welcome. If you encounter any problems with the downloading of my entry, please contact me at webmaster@bnmail.zzn.com . Please feel free to distribute it.